"This recipe is one of my family's favorites. It can be made in advance and then reheated, or you can make the different components ahead of time and then just assemble and bake for a quick dinner. Serve with sour cream and picante sauce or salsa." Preheat oven to 350 degrees F (175 degrees C). Spray a deep 12x6-inch hotel pan or casserole dish with cooking spray. Mix garlic powder, black pepper, cayenne pepper, cumin, marjoram, and oregano together in a small bowl. Heat a large skillet over medium-high heat and stir in ground beef. Cook and stir until the beef is crumbly and no longer pink, about 10 minutes. Drain and discard any excess grease. Add black beans, water, and taco seasoning; cook and stir mixture until most of liquid is evaporated, 5 to 10 minutes. Heat butter in a separate skillet over medium heat; cook and stir green onions in the melted butter until softened, about 5 minutes. Mix cream of mushroom soup, sour cream, green chile peppers, and garlic powder mixture into green onions; reduce heat to low and simmer until mixture is heated through, 2 to 3 minutes. Remove 3/4 cup soup mixture and stir into ground beef mixture; fold in 1/2 cup Cheddar-Monterey Jack cheese until well incorporated. Stir milk into the remaining soup mixture until sauce is smooth; remove from heat. Spoon about 1/2 cup ground beef mixture into each tortilla. Roll each tortilla around filling and place seam side down into the prepared pan. Pour sauce over enchiladas, spreading to completely coat. Sprinkle 1/2 cup Cheddar-Monterey Jack cheese over enchiladas. Bake in the preheated oven until cheese is melted and edges of the casserole are browned, 30 to 35 minutes. For faster prep: brown beef, season with taco seasoning mix, and freeze. When ready to use, thaw in microwave, stir in the black beans, and proceed with recipe. You can also make the sauce ahead of time and refrigerate until needed. Leftovers heat up in the microwave in a jiff and taste just as good as when freshly baked. 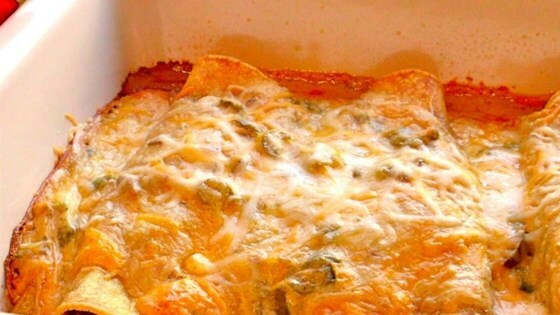 Wrap and freeze individual enchiladas and reheat in microwave for a quick and easy meal! Was easy to make and since the first review said it was a tad dry i added a can of enchilada sauce to it. I'm not big on this type of food but would make it again for something different. No changes need to be made to this recipe, it is FANTASTIC the way it is ENOUGH SAID. Super easy to make, and it was absolutely delicious. Definitely a favorite in this household now!!! It's really good. My family really likes it. Like one of the reviews said. It does need a bit more water then it says in the recipe but besides that. Really good. Yum malicious! Great recipe! Wouldn't change anything except load on the cheese at the end! Everything is better with lots of cheese! Great for a family meal!